Easy paper handling assured by single sheets and continuous forms loaded simultaneously. Standard-yield re-inking ribbon -- prints up to 4 million characters (in Draft mode at 10 cpi). Optional high-yield re-inking ribbon -- prints up to 8 million characters (in Draft mode at 10 cpi). 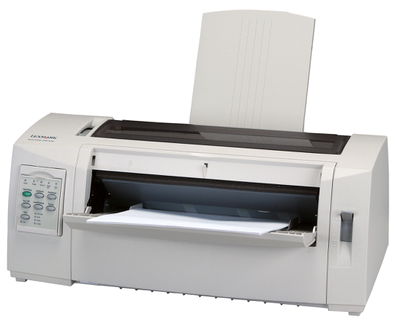 The Lexmark Forms Printer 2400 series has a long printhead life for minimal user intervention. Six languages are supported in the setup menu: English, French, Italian, German, Spanish and Brazilian Portuguese. Speed: 9-wire fast draft: 510 characters per second (cps) in Fast Draft mode at 12 characters per inch (cpi). Paper feed speed: Up to 7 inches per second (ips). Prints a wide range of media: 1+5 multi-part forms for 9-wire,plain paper and envelopes. Prints media of varying thickness: 9-wire: Up to 0.020". Noise level: a quiet 53 dBA (front microphone NLQ mode). Supports IBM PPDS emulation with euro support, EPSON emulation. Bidirectional parallel IEEE-1284 standard and USB standard, internal RS-232C serial option, optional Lexmark N4000e Fast Ethernet, N4050e 802.11g Wireless or MarkNet N7000e Fast Ethernet print servers.